In the latest featurette from Disney's Christopher Robin, Ewan McGregor sits down with his animated co-stars to get some real answers about starring in the film together. The behind-the-scenes featurette is titled Welcome to the Hundred Actor Wood and it's a humorous bit of promotional material for the upcoming movie, which hits theaters on August 3rd. Disney fans have already had their hearts melted by the recently released trailers and TV spots, so it's nice to get in some extra laughs before Christopher Robin hits theaters. Ewan McGregor starts his Christopher Robin interview off with Winnie the Pooh and asks him if he's anything like his character on the big screen. Pooh is clearly confused and asks, "like who? What was the question again? I was thinking about lunch." Next up is Piglet who reveals that he just says yes to everything as to not offend anyone, which is perfect for his character and makes it easy to see why he and Winnie the Pooh are such good friends. Next up in the Christopher Robin interviews, Ewan McGregor asks Tiger about his motivation and how he finds it. Tiger is very matter of fact about his answer when he says, "you gotta think like a Tiger, act like Tiger, and it helps to be a Tiger," which throws McGregor off guard. However, the most surpising part of the interview series comes from Eeyore, who claims that his onscreen character is much happier than he is in real life. Eeyore says that is character is all laughs in his deadpan voice. 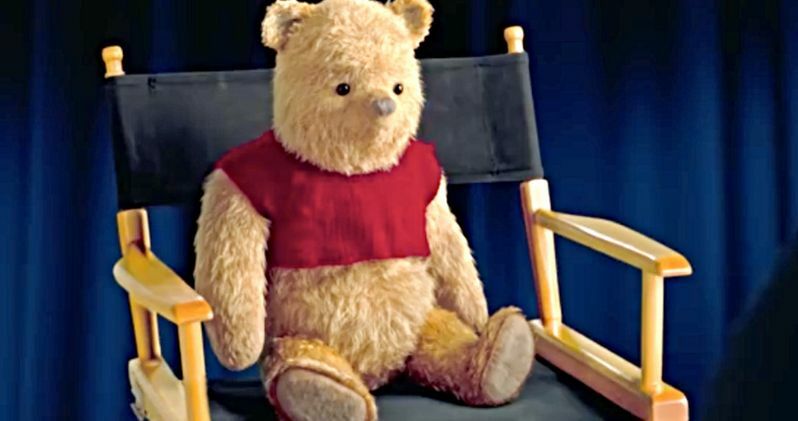 In Disney's Christopher Robin live action adventure, the young boy who shared countless adventures with his stuffed animal friends in the Hundred Acre Wood is now grown up, living in midcentury London and dealing with the stresses of adulthood. Now it is up to his childhood friends to venture into our world and help Christopher Robin rediscover the joys of family life, the value of friendship and to appreciate the simple pleasure in life once again. All of the promotional material for the film looks amazing and it will make a nice addition to all of the rest of the Disney live-action projects that have been coming out lately. Christopher Robin is directed by Marc Forster from a screenplay by Alex Ross Perry and Tom McCarthy and Allison Schroeder and a story by Greg Brooker and Mark Steven Johnson based on characters created by A.A. Milne and E.H. Shepard. The producers are Brigham Taylor, and Kristin Burr, with Renée Wolfe and Jeremy Johns serving as executive producers. The film stars Ewan McGregor as Christopher Robin, Hayley Atwell as his wife Evelyn, Bronte Carmichael as his daughter Madeline, and Mark Gatiss as Keith Winslow, Robin's boss. The film also features the voices of Jim Cummings as Winnie the Pooh and Tigger, Brad Garrett as Eeyore, Toby Jones as Owl, Nick Mohammed as Piglet, Peter Capaldi as Rabbit, and Sophie Okonedo as Kanga. As previously noted, Christopher Robin opens in theaters on August 3rd, but before that, you can watch Ewan McGregor interview his co-stars below, thanks to the Disney Movie Trailers YouTube channel.